Producer Darren Aronofsky and Chilean director Pablo Larrain bring an exquisite and heart wrenching portrait of Jackie Kennedy just moments after her husband President John F. Kennedy is assassinated in Dallas, Texas on the 22nd November 1963 in Jackie. Oscar winner Natalie Portman (Black Swan) is sublime as Jackie and considering that she is in virtually every frame of the film, shot in mostly extreme close up, Portman delivers a poignant portrait of Jackie as she is suddenly stripped of her position as first lady while also dealing with suddenly becoming a young widow to two small children, John and Caroline Kennedy. Simultaneously, Larrain explores the mythical concepts of History, Identity and Beauty as Jackie has to boldly deal with the aftermath of an assassination and the claustrophobia of grief intertwined with state politics and diplomacy. Jackie has to decide what type of funeral she would like for John F. Kennedy and amidst the security concerns following her husband’s dramatic assassination, she opts for a full length funeral parade, which symbolically become the most watched event on American Television in the early 1960’s. Screenwriter Noah Oppenheimer’s seductive script pulls viewers into the traumatic world of Jackie Kennedy, deconstructing the myth of a debutante stripped of her power, yet ironically her glamour and poise managed to embed itself in the American psyche for decades after her role as the First Lady of the United States. Jackie is a stunning, visually dazzling historical portrait of a very specific moment in American history, the aftermath of one of the most pivotal assassinations, which irreparably changed the course of American politics and society redefining the 1960’s as a tumultuous decade. Cleverly what the film does not do is delve into any conspiracy theories surrounding the infamous assassination, but exclusively focuses on how Jackie deals with the funeral and subsequent interviews afterwards. Audiences should look out for strong supporting roles by Peter Sarsgaard (Blue Jasmine) as Bobbie Kennedy, Greta Gerwig as loyal assistant Nancy Tuckerman and John Hurt as unnamed priest who Jackie confides in. Incidentally Jackie was one of Hurt’s last films before he died in 2017. The costumes by Madeline Fontaine, which she won a 2017 BAFTA Award for, are gorgeous clearly recreating the iconic style of Jackie Kennedy and the production design by Jean Rabasse (The City of Lost Children, Delicatessen) is equally fitting. What makes Jackie so inspiring is the unconventional approach of Larrain’s direction as he inter cuts scenes of the massive funeral march in Washington DC with the graphic violence of the actual assassination in the backseat of a convertible sedan speeding along a Dallas highway, blood stains on Jackie’s pink Chanel suit. Like director Barry Jenkins’s Oscar winning film Moonlight, Jackie intensely captures the audience’s attention and never let’s go, anchored by a brilliant performance by Natalie Portman who in my opinion should have won the Academy Award for Best Actress at the 2017 Oscars, although perhaps the odds were stacked in favour of Emma Stone winning for La La Land. 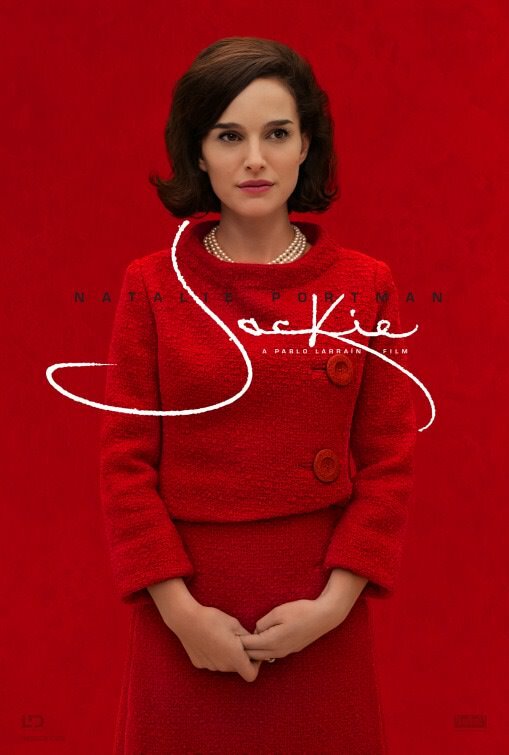 Gorgeous, riveting and emotionally draining, Jackie is a vivid and intricate tour de force of an iconic figure who used her widowhood to become more famous, made all the more touching by the scenes with her two very young children. My film rating for Jackie is 9.5 out of 10. Having directed an exceptionally vivid film, director Pablo Larrain is a talent to watch out for.